Well up at stupid o'clock as is normal when Chase Day 1 comes around. Today sees a Slight risk and 5% Tornado Risk over much of Arkansas and 2% further west. I am liking the RUC Model which breaks out Convective Precip just South of the Red River area in North Central Texas around 00z. There is a much higher chance the cap will not break in this area as opposed to further east but we will take our chances here today, later on another round of mainly elevated storms should move to the east south east overnight so positioning the team at a good location later for lightning and some dinging on the cars will be essential. There is a window of opportunity for a few Tornadoes today and I am happy with the moisture return going on presently with 72f Dp's on the Texas coast and 61f at DFW Where we currently are. Well after an eventful flight which got us in 3 1/2 hours late we are getting set up in readiness for Saturday 30th April for a slight risk of storms over NE Texas and Arkansas. Sunday looks like Eastern Texas and then cannot find anything of note in the Models until at least next Friday at the earliest, Mother Nature seems to have shot her bolt this week and is now having quite a big rest with High pressure dominating in the West! Looking like a potential Tornado outbreak today across parts of Texas and Arkansas and I'd expect the SPC To upgrade this to the 2nd High Risk of the Season. Substantial Clearing is occuring across NE Texas and Arkansas today leaving behind between 2000 and 4,000jkg of Cape and curved Hodographs across the risk area. The stage is set for discrete Supercells to erupt giving rise to possible long tracked tornadoes moving eastwards later today. 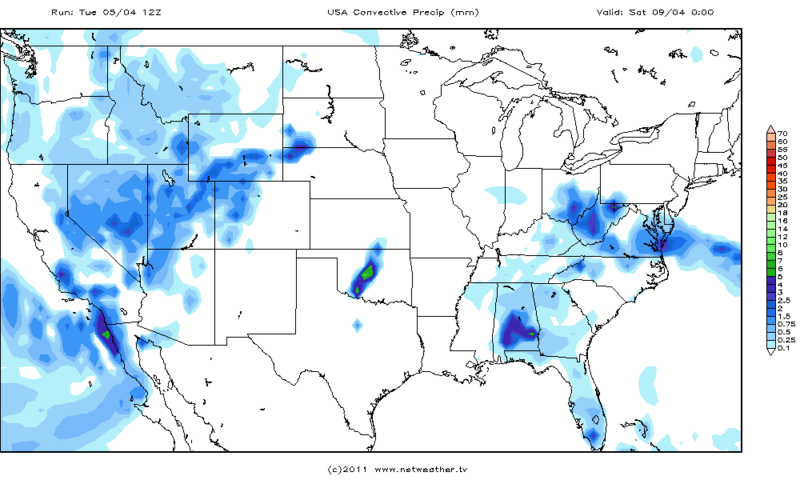 RUC/NAM AND GFS All break out Storms between the 18-00z timeframe. Having looked at all the parameters I am liking the US59 N-S Highway between De Queen and Texarkana to try and pick one of these Supercells off this evening and track it eastwards hoping for not so much HP Nature to the storms. Tomorrow another very severe risk looks like playing out across the Tennessee and Mississippi valleys before a quiter day on Thursday and Friday. For ourselves we fly out in 48 hours time and our first chase opportunity could come as early as Saturday across Northern Texas and North East Texas, one to watch and flying into the risk zone cant be bad on the mileage. Well the next 3 days are looking incredibly active as we have back to back Moderate Risks for 25/4 and 26/4 this will in my opinion have every chance for a High Risk on Wednesday 27th. Back to today and I think the trick will be to get yourself in a good chase position relative to where Storms will fire. By 3pm the Convective Crapvection boundary should be well into Missouri and the warm front lifting through Arkansas, I have a feeling the Warm Front will be North of LTR By 4pm and Storms should be firing in North East Texas and North West Louisiana, these will stream North Eastwards and have the greatest chance of Tornadogenesis before they hit the cold boundary and cross the Warm Front. Cape of around 2,000jkg and close T/D spreads should have LCL's favourable. A lot of people completely write of Arkansas due to trees and hills.......................but the areas East of Little Rock and Pine Bluff has around 100 miles of flat rice fields right up till you hit Memphis. So with this in mind just like 30th April and 1st May last year will sit in Stuttgart for today and pick the storms off as they move into more favourable chase terrain. Well just 4 days until we arrive at the hotel at Heathrow and get ready for the flight on Thursday. 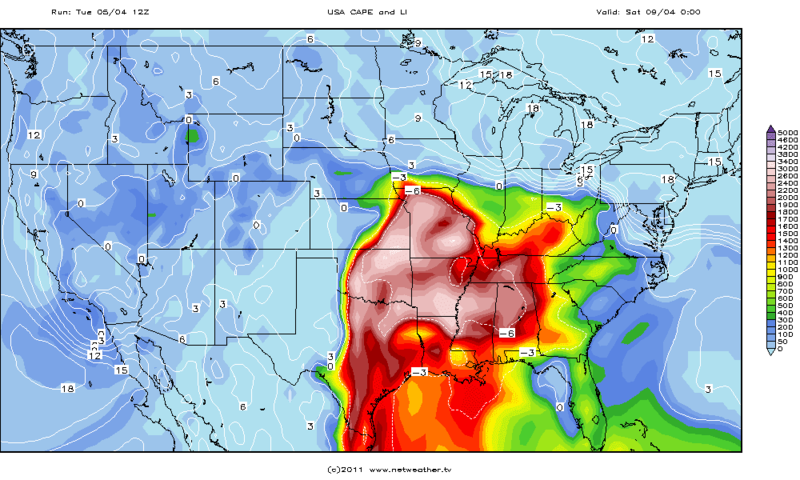 The next 5-6 days look great for chasing with multiple rounds of Severe Weather across the Southern portion of the US. We already have 470 prelimary reports of Tornadoes for April and this could easily go over the 550+ mark by 29th April. Now onto when we land and it is looking woeful I am afraid, all the active weather since the 14th April will be on it's way out into the Atlantic and a ridge is looking like setting up across the Intermountain West for about 6 of 7 days it seems. Chasing has been looking limited to non existent for the first week of May with no energy building up and an absent Jet Stream Pattern but the 06z GFS gives slight hope the pattern might not be as bad with possibilities around the 3rd & 4th. There are signs if the ridge sets up it could breakdown around the 6th May and something could be chaseable around the 7th or 8th but GFS Is usually the faster model and dont be surprised at the time if the ECMWF Model delays this which could make for a race against time for our tour 1 guests as to wether anything severe crops up. Hoping the Models change in the next 3-4 days. Well it makes grim reading at the moment and I am trying to find something that even looks worthwhile but right at the wrong juncture the 2011 Season looks like it is starting to Slow down as most chasers hit the plains. Latest 00z GFS Is an absolute horror show with chases from today (Fri 22nd) all the way upto (Fri 29th) and just as we start our first tour..............BANG - Ridge! A lot of course can change but from the 29th until the 7th May there is constant North or North-Westerly flow with little or no energy and an absent Jet Stream way up over Canada or diving South across the eastern states. Well this morning I am pretty gutted at what the models are showing, after nearly 6 weeks of continual troughing the dreaded ridge pattern is rearing his ugly head just in time for May from some of the longer range Models this morning. The next week looks fantastic ending yep you got it the day we land at DFW On the 28th April. For Friday I can see another solid Moderate Risk in Missouri and Illinois with another great chance for Tornadoes in both States, I'd expect a possible Day 2 Moderate Risk Upgrade tomorrow from the SPC. Saturday sees somewhat of a lull before more possible Severe weather for Sunday. Now Monday to Wednesday (25-27th) is really grabbing my attention with multiple rounds of Severe Storms possible firstly in the Texas Panhandle for Monday, then Kansas and Oklahoma for Tuesday and again the Mississippi Valley for Wednesday. After this a strong ridge is showing on the latest 00z GFS Model shoving the Jet up into Canada and keeping Moisture miles away in the GOM. The one fear I have is once these Ridge patterns set in they can persist for upwards of 2-3 weeks and get termed "Death Ridge" I pray this will only be a temporary ridge for the weekend after easter and troughing can set up once again. Ok had a look at the Models this morning and am going to leave my morning Position of Jefferson City and move eastwards through St Louis and base myself at Effingham (Illinois) and play the warm sector in the hopes something can fire east of the Low and not get outdone by the Cap. I have no doubt the first convection will fire around the NE Oklahoma, and SW Missouri area but this will very quickly evolve into a monster Cold Front Squall Line, there is a breif window for discrete Supercells before this happens but I would not fancy the terrain over there, By 9pm there will be a Line stretching from NE Texas to NE Indiana marching eastwards with more of a High Wind event. Helicity and Shear look very nice east of St Louis with 2000 - 3000jkg of Cape and good Temp and Dp Spreads at around 74/62f. Well what an Outbreak that turned out to be, starting on Thursday 14th April and ending Late on Saturday 16th April from Oklahoma, Arkansas, Mississippi, Alabama, Virginia and North Carolina. Numerous Fatalities are the grim side of mother nature and this always seems to be the case when Negative Tilted Troughs with Ample Moisture advected by the Low Level Jet impacts these areas. One thing that was apparant was the difference in the local tv channels with the way they respond to the Severe weather as it is impacting their listening areas. In Tulsa on Thursday they had the helicopter up for amazing pictures for their viewers and were focusing on areas of rotation and where it would be heading, contrast this with the coverage for N Carolina on Saturday and it was stark just how unready the mets were with them focusing more on viewers sending in pictures and reporters going to buildings that had just been hit, communities in the line of fire North of Raleigh had no coverage of what areas of the Supercell were likely to have rotation pass very near to them, they did get a bit better later on but even so very rusty coverage. Maybe this is the reason more people lose their lives further east than in parts of Oklahoma, Texas and Kansas and most of the plains where the coverage is first class for expereinced mets that know what needs to be put out there. A lot had been made also of Storm Basements being numerous in the Plains as opposed to the Carolinas which could have had an impact as well. At the time of writing it looks like their have been upwards of 200 Tornadoes with nearly 50 deaths and numerous injuries from this active weather, and it looks like Tuesday 19th April is going to see more severe weather over Missouri and Illinois. Well after yesterday's Outbreak that I still firmly believe should have been High Risk the attention for Saturday 16th Shifts to the Carolinas, again there should be some Tornadoes out of this now 3 day event but nowhere near as many as Alabama and Mississippi yesterday, although the risk for a Long Track Tornado in the EF4 Category is stronger than yesterday. Moving onto the next possible Severe Event and it looks like Tuesday 19th sees a Shot for Oklahoma, Arkansas, Missouri and maybe Eastern Kansas, the risk extending as the day wears on to Southern Illinois and Western Kentucky. Monday 18th sees a slight chance of something in Nebraska, Kansas and Iowa as well but current indications are of High Based Hailers with the Cap holding all that Cape surpressed further South across Oklahoma and Texas. When Models become a little clearer on finer scale features will update Tuesday's risk in the next few days. Had a quick look over the morning's models and have settled on my Chase Target for today based on a quick blend of the GFS & NAM Obviously wont be able to refine it on the RUC etc as work commitments stop me having Internet access today. Very much liking the Ardmore - Mcalister - Hugo Triangle and somewhere in there for a Supercell to Develop and move off the Dryline, LCL's are just about favourable the further North in that triangle and T/td Spreads look very nice at 73/62 which should have those bases very low. South South East surface flow with stronger South Westerlies at H5 to help initiate something down there at 00z. My main concern about further North is the Moisture, only 62f just above the Texas Coastline atm and only 20knt Winds transporting that moisture northwards makes it a race against time for moisture return. Hodo's very nice along the length of the risk area and I'd expect 1 or 2 Strongish Tornadoes around the EF3 Mark to occur today.Tomorrow looks very nasty if a few Supercells can get going ahead of the Line in Eastern Mississippi, that as well could go High Risk tomorrow. Good luck to all chasing today in what could be challenging chase conditions east of US75! As expected in yesterday's Blog the SPC Have indeed upgraded to Moderate Risk. 45% Hatched is not to be taken lightly on a SWODY2 but still differences in the Models from wether this is going to be a Classic Tornado event or a Moderate Risk for High Winds, the Hatched Hail Risk should also be quite High for tomorrow with upto Baseball Sized Hail expected. At the Moment there are 2 plays in town, the Cold Core Set Up in North East Kansas down to Eastern Kansas, then the Dryline Risk extending down through Central Oklahoma. NAM Model is slower than GFS And would give better chasing areas to play with. Todays model runs are crucial wether we get a higher Tornado Hatched box or a High Wind Hatched box, due to what the winds are going to do along the dryline and the positioning of the LP. Thursday 14th looking a lot better now on the Medium Range Models with Thursday having at least Moderate Instability across Eastern Oklahoma, North East Texas and Eastern Kansas. The good thing is the GFS Has trended westwards on the latest runs and sets up the Dryline along the I-35 Corridoor. The better Tornado chances are furtjer east when Supercells Mature and hit the better Shear and the cranking LLJ. All this congeals into a Messy MCS Over the Arklatex overnight Thursday into Friday leaving a Friday risk in the Tennesse Valley. Looking further ahead Monday looking pretty scary at the moment with Moderate to Strong Instability progged across the Southern Plains, this could be the biggest set-up of the year for these areas if Models continue to show the Northward expansion of rich GOM Moisture ahead of the ejecting trough. The GOM Really is wide open this year in transporting moisture northwards it seems. So after the back to back Moderate Risks we now have something of a lull in proceedings with 3 days of settled weather west of the Tennessee Valley. Thursday 14th April looks the next chase day but once again rough chase areas look like being in the offing. Obviously a lot can change in 3-4 days but at the moment the Storms look like firing in the jungles of Eastern Oklahoma and moving through the Arklatex and Ozarks North West of Little Rock. Nightmare Road options and hills and trees so take your Chainsaw if you venture out. After this NW Flow looks like setting in on most of the Mid Range Models, lets hope that changes in the next few days or it could be a tad quiet over the Plains for the next week or so. Having awoken to the expected Moderate Risk upgrade in Des Moines would be probably staying put for now and awaiting the better fine scale Meso Models later on. Expecting quite a few Tornadoes to occur today along an E-W Warm Front that should by 23z be lying across the far north of Iowa. I am expecting the first Storms to fire around the NE - SE Nebraska region and track up towards Southern Minnesota and with time move more eastwards enhancing more of a Tornado Risk. Cape values of 3,000jkg and ample helicity look very nice, forecast skew-t's and hodo's in Northern Iowa and S Minnesota also look favourable in a 3 hour window from 23-02z. Another area that has now come into the fray is the Central Oklahoma To S Central Kansas area along a bulging Dryline, LCL Heights look favourable down here and winds eventually look like backing to the SE, one of the most important things for a great Tornado Set-Up which is not yet resolved could be residual Outflow Boundaries from Friday 8th April's Storms. We all know how good OBs can be with regards to Cycling Supercells dropping Tornado after Tornado. This Set-Up although not the same synoptically reminds me of the 24th May 2008 when everyone and their dog were up in NE Nebraska and NW Iowa when a lone Supercell latched onto an old Outflow Boundary and rampaged across Kingfisher and Garfield Counties dropping tube after tube, One to watch for sure in much better chase terrain. 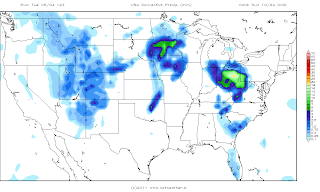 Tomorrow as expected looks to be going HIGH Risk as I said a few days ago, Models if anything looking even better for Wisconsin and there could be multiple rounds of Long Track Tornadic Supercells across this region tomorrow. Models getting some great cross model agreement now regarding the Strong Trough affecting the Upper Midwest Saturday and Sunday. 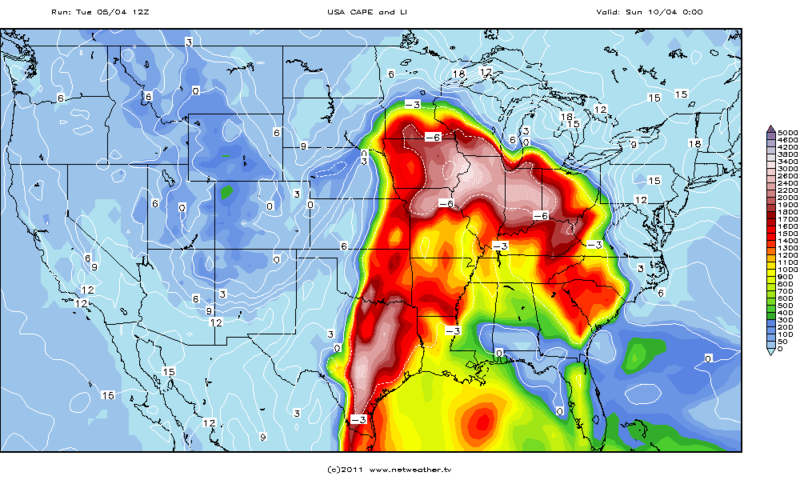 An impressive Mid Level Jet Streak should make Saturday go Moderate Risk across Iowa along a stationery Warm Front, and for this reason would probably discount the Isolated Supercells across Oklahoma today and make the trip to Des Moines for Friday Night in the virtual world. If Saturday looks great Sunday looks scary across the same regions and points north and east of there. At the moment Wisconsin and Minnesota look amazing just NE Of the 987 Low but those areas are hard to chase at the best of times, it could be that some Strong to Violent Tornadoes are possible as the SPC Has a 45% Hatched area already for the Day3 Outlook. To keep it real would probably be looking at the far North East of Iowa for Sunday and hope the LP Slows down and the risk area gets pushed further south into more chaseable terrain. Having looked at some Model data this morning would be selecting a Chase Target of Ardmore (Ok) at the moment, Convective Precip breaks out along the Dryline through North Central Oklahoma down towards the Lawton area, Initiation time looks to be about 23z giving us about 2 hours for some Structure Heaven with Temps around 86f and Dp's around the 60f Mark. High Cape Dryline Storms are usually pretty but as these will be Diurnally driven the risk looks set to wane around Sunset, Tornado Chances look slim and would be hot footing it out of there and heading North on I-35 Once the day is done probably ending in Wichita (Kansas) at around 2am in readiness for what looks like an amazing day on Saturday in NE Kansas, SW & Central Iowa (Again!!) But will concentrate on Saturday in a Later Post! Well at 1420 the temperature hit 23.4c which surpasses the old Uk Temperature Record of 23.3c, obviously it is not going to be used in the records as the UKMET Use Southend Airport or Shoeburyness Landward but seeing as this Reading is only 0.7 Miles from the Official Site we could be in with a chance. Well Looks like the SPC Now coming on board for Friday and Saturdays Dryline Event, latest SWODY3 Shows the Dryline play in Central Oklahoma through Central Kansas for Supercells to erupt, the CINH Should not be a problem with an ejecting Impulse aiding with the CI. Not looking great for Tornadoes on this day but Saturday looks much better from Iowa all the way down to Western North Texas. Thursday 7th Risk would see us setting up shop virtually in Wichita (Ks) Tonight awaiting the morning's model runs to see where Convective Initiation is likely for Thursday's Risk. Sunday still looks decent enough but I have a feeling the risk will be way off to the East by then and Illinois down to the Tennessee Valley looks likely to encounter Severe Weather. Well having viewed the 00z GFS & NAM My drive to Topeka (Kansas) would hold us in really good stead at the moment. All the Models are pointing to Eastern Kansas and the Triple Point play from an area bounded by Emporia - Topeka - Kansas City. Both Models break out precip at around 22z and then extend it further down the Dryline, current thinking is about 3 hours to get the job done before the Cold Front comes crashing through and makes it a linear mess evolving into a Eastward moving MCS at around 03z. Easterly surface winds and decent directional shear should get a few Tornadoes to spin up in this area, and would expect a 5% Hatched from the SPC In their 08z Update. 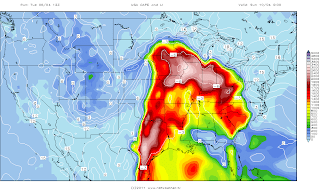 Some massive Cape Monster Hail Storms could go up much further South with 3,000jkg of Cape with surface temps of 92f and Dewpoints of 68f all point to High Based Hailers further down the dryline. 1st it was Oklahoma and Kansas then Nebraska, even parts of Missouri, but the latest Models yet again have changed with the GFS Firing Supercells in NE Kansas at 00z whereas the NAM Is showing Iowa lighting up with a Warm Front play. I still believe the Dryline is going to struggle to fire anything further South until the SE Moving Cold Front crashes into it and even that might not be until after dark. With this in Mind last nights Overnight Position of Hays (Kansas) would be changed tonight to Topeka (Ks) and await tomorrow's models, I have a feeling tomorrow is the day when 2 or more of the Models will converge on a pretty good chase area. Monday looking much more linear now with ongoing Storms across the Risk areas and little if any Cap inhibiting stronger Storms. It all looks like Iowa again!